First, our most important news: I have added a third trip to the “My Trips” page on Delta.com, and it will come prior to the other two trips I recently booked. On February 1, I will fly south to Kansas City and that night I will attend the Kansas City Mavericks hockey game in nearby Independence, Mo. The Mavericks play in the ECHL, which is a large professional league with teams scattered over much of North America. In baseball terms, it would be the equivalent of a Double-A level league, so two steps below the NHL. Why do I need (or want) to travel to Kansas City for a minor league hockey game? There are multiple answers. First, Alexa Jacobsen (daughter of Neighbor Dave and Nichol) has a longtime boyfriend who plays for the Mavericks. His name is CJ Eick. I sorta kinda “borrowed” this shot of the two of them from Alexa’s Facebook page because it’s just too adorable. I understand how Junior Hockey works, and when we lived out in Liberty Lake we went to see one of the best Junior teams around, the Spokane Chiefs, on multiple occasions, but what I don’t know are the personal stories about what it’s like to leave home and live with another family in a far-off town to play your favorite sport, but one level down from being a pro. Junior players are usually 18 to 21 and are amateurs. That way, when they’re done playing at that level they have the option of still going to college, because their eligibility is protected. They play hockey full-time, and travel like crazy, but they do it for free. It’s a great experience for them, and many go on to college and pro careers. They learn how to put hockey first and concentrate on developing as a player and maturing as a person. “But CJ is a pro” you said aloud. He is, but after high school he went to play Juniors, for the Green Bay Gamblers in the USHL. So, I’m heading down to KC to see Alexa and CJ, and to hopefully have some enlightening conversations about just what it was like to do that. After the Gamblers, he did go back to college and had a great career at Michigan Tech. 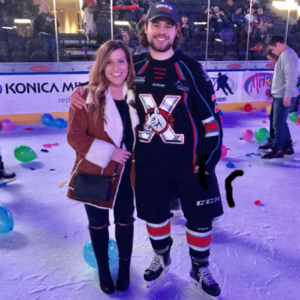 He originally signed to play pro hockey for the Utah Grizzlies in the ECHL but was traded to Kansas City during the 2017-2018 season. He’s a bright young man, and a heck of a hockey player, so this should be really valuable. Plus it will be fun. The Mavericks play the South Carolina Stingrays both Friday and Saturday nights, so I’ll get to see CJ play twice. That will be two more times than I’ve ever seen him play. Go CJ! Go Mavericks! Bob & Bob, circa 2013. We were younger then. Ah, but yes, there is another reason to make the trip. If you read “Bats, Balls, & Burnouts” and remember the chapter about my stint as GM of the Kansas City Attack indoor soccer team, you may recall that I hired a guy named Bob Rennison to be the radio play-by-play announcer for us. He was fantastic, and it was his first professional play-by-play job. 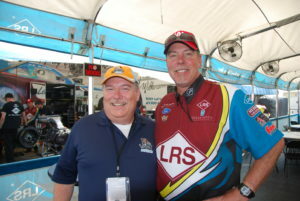 He’s been a pro ever since, and is currently the announcer for the Mavericks. I’m going to get to the arena early on Friday so I can visit with Bob up at his broadcast position. We talked on the phone at length the other day, and it was Bob who told me about the two-game series on Feb. 1 & 2, and how the Mavericks have a long road trip not too long after that. Couple that road trip with my huge travel schedule in March, and it made perfect sense to get down there for these two games. I’m looking forward to it. Go Bob! And speaking of Roseau, I traded emails with Roseau native and former NHL player Paul Broten the other day, and he’s going to help me once again with a list of “stupid questions” I have for that part of the book. Paul has been a phenomenal resource and he’s always willing to talk about anything I need to know. The fact he’s a real-live player from the Roseau Rams class of ’84 team makes him a “fictional teammate” of my character. I also sent an update note to Larry Guggisberg, the Superintendent of Schools in Roseau, and he sent a really nice note right back. Larry was the guy who orchestrated my entire three-day trip to Roseau, setting up all those meetings that opened my eyes to a fantastic hockey-crazy town. Larry mentioned that the Rams are having a really good year, and are hopeful of a long run in the playoffs. How cool would it be for them to make the State Tournament at the Xcel Energy Arena in St. Paul? Answer: It would be very cool and Barbara and I would most certainly be in attendance to root for them. As for the book, I’m hitting a good sweet spot lately in terms of writing. It’s coming easily and I’m adding a lot of pages per week. I’m into Chapter 11 now (I’m talking about the book, not my finances!) when my two characters are teenagers and life is changing fast. It’s been mostly drama free for them up until this point, but that’s about to change very soon for both characters. When will I be done? When will it be published? What will the cover look like? All good questions without definitive answers. I don’t have firm plan for how long it will be or how many chapters it will contain. I’m just writing it organically. I’ll know I’m done when I’m done. And Greg and I will certainly do our final editing as a team again. Once we do that, it’s a month or two to get it published and “out there” in print. As for the cover, I have a firm vision for it but it’s going to take a really talented illustrator to bring it to life. As of right now, I’m planning on using Outskirts Press again. They did a great job on the first one, and they’re a one-stop shop for a lot of great resources. But, of course, if a traditional publisher comes along and wants to actually pay me for the publishing rights, we can talk. As for the screenplay… That’s kind a joke but people keep bringing it up. I’ve heard from more than a few who think it’s going to end up as a film of some low-budget sort. I’ll believe that when I see it, but we can dream! OK, we have a bird feeder in our crabapple tree, and the little birds that live here for the winter go nuts over it. The thing is supposed to be squirrel-proof, but that is now a proven falsity. There are two squirrels who have figured it out. It’s designed so that the perches the little birds sit on to eat will only hold their weight. If a squirrel puts his little feet on there, it’s supposed to close a door so he can’t get to the seed. These two guys have found a way to grip onto a nearby branch with their hand claws, and then stretch out fully horizontally to grab the feeder by the perch, but then the pull it toward them without pushing down. Stupid squirrels are actually anything but stupid. Finally, why shouldn’t we talk about my new sandals. We should! She was right. I loved them and they lasted from 2005 right up until our Hawaii trip in December. So, they made it about 13 and half years. The leather straps were still perfect. They’d aged a little, as they should, but they also adapted and molded perfectly to match my feet and I loved them. And then, on Kauai, on the exact same day, both soles cracked and broke. I was heartbroken, and also stunned that both sandals picked the same day to die. I was also sure that Mephisto most certainly would have long ago changed the model. Shoe companies do that all the time and it drives me nuts. I was on a longterm adidas kick in the early 2000s, but then they changed my favorite model because, well, I don’t know. So I switched to the new Reebok Zigs, as did a lot of NHRA guys, and I bought four or five pairs of those. And then Reebok changed them because, well, I don’t know. Lately I’ve been 100 percent loyal to Asics, and so far (knock on wood, or Asics gel) they’re still making them basically the same with only some fun cosmetic changes. 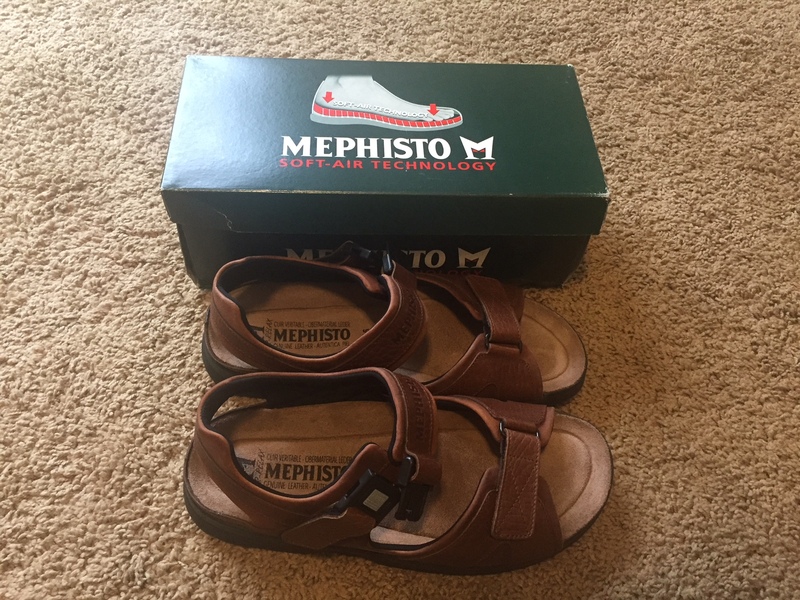 I wasn’t even sure Mephisto was still in business, but I found their website and found the “Sandals – Men” section. There were a lot to choose from, but I didn’t see anything like my old reliable pair. And then I looked at Page 2. There they were! Almost exactly the same. Bravo Mephisto! I applaud you. Buying them direct saved me some money, as well, and the UPS guy just dropped them off on the porch. I’m already breaking them in to perfectly mold to my feet, and they’ll be perfect by the time I get back to Kauai in March. Standing ovation for my new Mephistos! While actually wearing my new Mephistos! So there we have it. Yet another in the longstanding tradition of blogs about nothing, full of random scattered thoughts and digressions. I’m pretty good at it, I think. I’ll be back next week on our regular day, and hope to have a gripping and compelling story to tell. We’ll see about that. As always (you know the drill) if you read this Slip-and-Slide of a blog and enjoyed it even one iota, I hope you’ll click on the “Like” button at the top. I can combine “Likes” with blog credits to hopefully reach my goal of a free pack of gum. 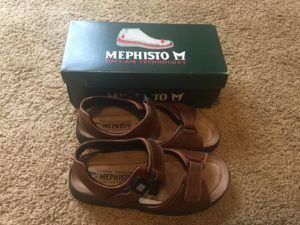 Bob Wilber, at your service and wearing his new Mephisto Sandals around the house.